Feeling glum about gum disease? From the natural means of healthy living to intervention via cosmetic medicine and surgery. we are constantly trying to turn back the clock against the relentless process of growing old. In the end, our attempts yield only limited success. Yes, our eyesight will dim, our hearing will deteriorate, muscles will weaken and wrinkles will become more apparent – all these and more are part of the ageing process. Contrary to an old but popular belief, tooth loss is not part of growing old. In fact, our teeth are designed to last us a lifetime. Having a smile with our natural teeth, and strong and healthy gums should be within reach for most people. Too often, older folks assume that loose teeth result in tooth loss and wearing dentures is a foregone conclusion. This is far from true; gum disease is well, a disease. Most of us know about tooth decay and how certain bacteria in our mouths can produce acids to dissolve tooth enamel to form cavities in our teeth, thus causing toothache and if untreated, tooth loss. However, very few understand or have even heard about gum disease. The gum disease that should concern us is not gingivitis (a superficial gum infection around the teeth) but periodontitis. It is essentially a chronic inflammatory disease with dental plaque (a bio-film of bacteria found on tooth surfaces) being identified as a major contributory factor. Simply put, periodontitis is a disease that involves three major factors: Genetic in which scientists have evidence to suggest that only some people born with certain genetic factors will be prone to developing periodontitis; the presence of certain “bad” bacteria in our mouth and the lack of good oral hygiene leading to the accumulation of dental plaque and sub gingival calculus. Besides bleeding from the gums, bad breath or bad taste in our mouth, there are no other significant symptoms. Once established, periodontitis will progress silently with short episodes of acute infections. During acute infections, there is a tendency for gums to swell with a build-up of pus and this causes pain and discomfort. Most people in this region would assume that the gum swelling is due to “heatiness”. If the swelling is “disturbed”, the pus may be discharged and the swelling will go down, leading to the thinking that the problem has been solved. While the swelling may subside after the pus is discharged, periodontitis continues to fester and the disease worsens. Bone loss around the teeth will continue, resulting in a loss of support for the gums and manifesting itself as gum recession. The recession of gums will lead to spaces or gaps forming between teeth as well as “longer looking teeth”, hence the expression “Long in the tooth”! The root surfaces of our teeth will be exposed and this is likely to make our teeth hypersensitive, particularly to colder food and drinks. Furthermore, the root surfaces of our teeth are more prone to acid attacks from bacteria. This may also lead to an increased risk of decay occurring around the roots of our teeth. Among the signs of periodontal disease are bad taste or breath, bleeding gums, receding gums, loose teeth, tender or swollen gums, pus from gums, change in the way teeth meet when biting, and spaces or gaps appearing between teeth. However, most of these signs are easy to miss or even dismiss. Due to ignorance, most do not consult dentists until discomfort or pain is felt. Periodontitis is a “silent” disease as opposed to tooth decay where a small cavity can potentially cause a severe toothache. Therefore, we must be vigilant in checking for signs of periodontitis. Active surveillance through regular dental maintenance by dentists will help pick up early signs of periodontitis. This will enable dentists to treat the problem early. More complicated and expensive treatment to save our teeth could then be avoided. To check for periodontitis, a thorough clinical examination using a special probe to check for gum pockets around the teeth as well as X-rays is essential for an accurate diagnosis. Can medications affect your gums? Many types of medications can have significant implications for conditions in our mouths. More than 300 different types of medication (for example, diuretics, anti-hypertensives, anti-depressants, anti-psychotics and anti-cholinergics) have been identified to have an impact on salivary glands, causing the flow rate to be reduced. Our saliva plays an important role in maintaining conditions that are conducive to good oral health. It too provides protection against disease-causing micro- organisms, while facilitating our speech, singing or playing of wind instruments. Besides containing enzymes that help digest our food, saliva also has lysozymes, antibodies and other active agents that kill or reduce the growth of bacteria. Finally, our saliva acts as buffering agents that neutralise acids produced by decay-causing bacteria. Therefore, good saliva flow is important and will help keep our mouth moist and healthy. Periodontitis is a “silent disease as opposed Lo loolh decay where a small cavity can potentially cause a severe toothache. Therefore, we must be vigilant in checking for signs ofperiodontitis. enamel against acid attacks. There are also oral antiseptic mouth rinses that can help reduce the number of oral bacteria by more than 99%. Suitable mouth rinses include those containing chlorhexidine like Esemdent or Bactidol or those containing essential oils like Usterine. Other medications like nifedipine (heart drug), cyclosporine (anti-rejection drug) and phenytoin (anti- epileptic drug) can cause gums to swell. Most patients taking these medications need to take them long-term if not for life. Therefore, good oral hygiene is essential to help reduce the risk of drug-induced gum swellings. In addition to keeping excellent oral hygiene, regular dental maintenance visits to monitor closely gum conditions will help keep gum swellings at bay. However, if gum swellings are established and remain despite good home care and professional cleaning, minor gum surgery may be required. Recent research has revealed a connection between periodontal disease and other systemic disease conditions. Growing evidence indicate that diabetic conditions cause various detrimental changes from defective blood capillaries to problems with immune defence mechanisms. It has been shown that diabetics are two to three times more likely to develop serious periodontal disease. Diabetics are prone to infections and since periodontitis is a chronic infection, it calls for early diagnosis and appropriate treatment. With good oral hygiene and regular dental maintenance, periodontal disease can be prevented and even diabetics can enjoy good gum health. More recently, research has also linked untreated periodontal disease with pre-term labour/low birth weight babies, cardiovascular disease and stroke. How these associations work and their implications are still unknown. More research is needed in this area. Where there is no specific “cure” for periodontitis, effective treatment, active surveillance and preventive maintenance can control this disease and maintain our gums’ well being. Your dentist or periodontist is in the best position to help diagnose and treat periodontal disease, before providing a tailored preventive maintenance programme that suits your disease profile and relative risk for recurrence. While it is important to brush our teeth daily, we can also cause problems with the wrong technique or habit of brushing teeth. For example, if we use the wrong type oftoothbrush or over-brush, we can slowly cause gum recession. Get coached on tooth brushing and flossing, and use the right technique! Today, we have a wide range of oral hygiene aids to help us maintain clean and healthy teeth and gums. Remember, being toothless is not part of ageing; our teeth can be maintained and kept functional throughout our lives so that we can always enjoy our food! Dr Chung Kong Mun is a consultant periodontist ar Pacific Healthcare Specialist Centre. 1 Brush before breakfast and before sleeping to reduce bacteria count and acidity. 2 Special care is needed if you take long-term medication for diabetes, hypertension, depression, coronary heart disease, stroke, arthritis, etc. 3 See your dentist regularly for preventive maintenance to detect problems early or even prevent them. 4 Be alert to signs of periodontal (gum) disease. 5 Be careful when eating foods with bones and seeds as your teeth become more brittle. 6 Remove dentures for soaking overnight to avoid denture stomatitis and fungal infections. 7 Avoid over-brushing by using a soft-bristle brush. 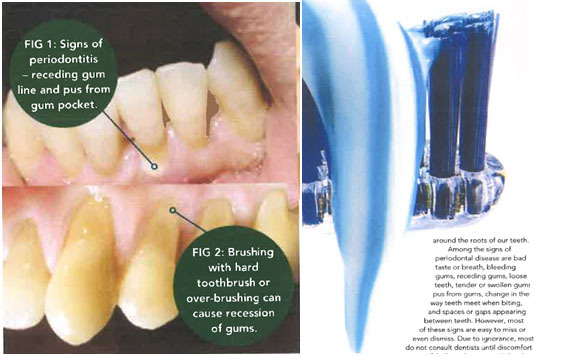 Age- related gum recession will leave exposed roots more vulnerable to over-brushing. 8 Drink more water if your medication or medical condition causes dry mouth.